We’re entering the beautiful days of summer in Jacksonville right now, and people everywhere are trying to come up with ideas that will help them get the most out of their backyard. As Jacksonville’s premier landscaping company, people are often calling us to ask about the state of their backyard, and whether we have any ideas about how to make it more attractive as an entertainment space. One of our most popular ideas for improving backyards in Jacksonville is the outdoor fireplace. Now, you might be thinking “This is Florida. Why on earth would I want an outdoor fireplace? !” but just hear us out. There are actually many reasons why installing a fireplace is actually a smart idea for your Jacksonville backyard. Keep reading to discover just a few of these benefits, then contact C&L Landscape for a consultation about adding an outdoor fireplace to your property! As we’ve already mentioned, people in Jacksonville are always looking for ideas that will help them get out of the hot, stuffy house and into the backyard they spend so much time weeding and mowing.When you install an outdoor fireplace, you immediately create a space for gathering, laughing, and enjoying the company of others. People are automatically drawn to a fireplace, whether it’s indoors or out. Not to mention that a fireplace helps keep away the bugs during muggy Jacksonville nights! Sure, we live in Florida. We don’t exactly have to worry about huddling around a fireplace for warmth in the winter the way they do in Colorado or Alaska. But that doesn’t mean an outdoor fireplace can’t come in handy. While the rest of the country is getting snow, the weather gets moody and chilled here in Jacksonville. Instead of abandoning your patio because the temperature drops, an outdoor fireplace gives you a reason to stay outside longer. Why spend time driving to a nice restaurant and paying $50 for a bottle of wine when you can create an incredibly romantic moment in front of your very own outdoor fireplace? Fix up a platter of cheese and crackers, uncork a bottle of reasonably priced Pinot Noir, add in the crackling of a fire, and you’ve got a recipe for romance. Are the grand kids coming over for the weekend? With an outdoor fireplace in your backyard, there’s no need to worry about how to keep them entertained. Grab some hot dogs and roast them, toast up some gooey grilled cheese sandwiches, and then switch to marshmallows or s’mores when dinner’s over! If nothing else has convinced you that an outdoor fireplace is a great idea for backyards, this will do it: they can increase your property value! 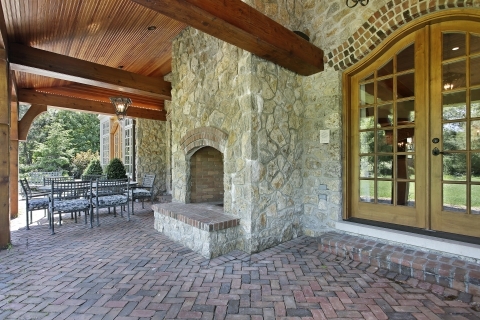 If you’re planning to sell your house someday, having a professionally-installed outdoor fireplace is a great way to ensure that your property will fetch a better price. Intrigued by these backyard ideas? Contact C&L Landscape in Jacksonville to see how easy it can be to have your very own outdoor fireplace!